Hair color can be a very touchy prospect when it comes to kids, but Fashion Angels is hoping to change that with it's new temporary color kit- Hair Chox. Billed as "no muss, no fuss" Color Rox Hair Chox color kit (which was released this past Spring) is now available in wider release. The latest product in Fashion Angels line of hair accessories and products allows for a fun use of color that's temporary, so there's no committing to that green (or whatever) stripe for any length of time. It's proving to be quite the little hit for the company too. "When we introduced Hair Chox, it was an immediate hit. It has really taken off this Summer and it'll definitely be one of our top selling products of the year," proclaims Bill Uzell, Executive Vice President of the company. The color was a success at the annual Big Toy Book Suite Sweet mini-con too. The event takes place during the BlogHer convention in Manhattan and hosted over 300 bloggers. Suite offered a look at some of the latest and greatest toys for the coming year at the Viacom building. The Toy Insider Mom and host of the Sweet Suite event, Laurie Schacht, said, "There was so much buzz around Fashion Angels, especially the new Color Rox Hair Chox. By the end of the night, the party was filled with women, me included, rocking different streaks of color in their hair." 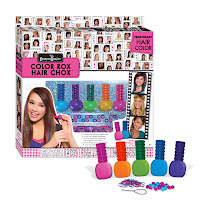 Color Rox Hair Chox kits are priced at $11.99 (which isn't bad at all) for kids ages 8 and up and are available now. The new Color Rox Hair Chox ($11.99 for ages 8 and up) offers fun, affordable experimentation with the tween trend of hair coloring. The Fashion Angles kit is a parent-friendly alternative to permanent or long-lasting messy hair dyes with an easy application that a child can do themselves or with friends, and the brilliant temporary colors simply wash out with shampoo. The kits include five temporary hair color chox stems (purple, pink, blue, orange and green) with comfortable applicator grips, as well as 24 beads, 24 rubber bands and a bead threader for more hair decoration alternatives. Fashion Angels also offers all of its Hair Chox color favorites as individual Chox ($3.99 each) sold separately.